Triathlon is on the up. If you’re considering it, welcome to a new world of supreme fitness! On the physical side, you’ll grow muscles in brand new places, while on the mental side, the variety you’ll experience will enhance your wellbeing. You get to meet new people, learn new skills and forever keep things ‘fresh’. So, where to begin? First up, keep it simple. If you’re considering dipping your toes into your first super sprint, forget over-complication. This applies to kit, strategy and training — all you need to do at first is just ‘do’. 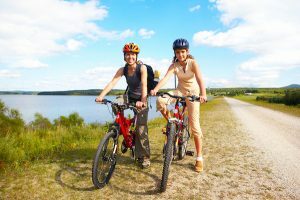 Starting off with a just do it attitude means that you aim to do a swim, a ride and run a minimum of one each per week. If you are totally new to the multi-sport, or right at the beginning of your new training programme (which usually lasts between 3–6 months depending on whether you’re starting with a super-sprint or planning to ‘go long’), making a pact with yourself to just do one of each sport per week to start with takes the stress away from getting going, which can be the hardest bit. That said, many of us can have stacks of motivation at first but lack sticking power later on, and this is where you need get strict with yourself if you really want to succeed. Again, a simple approach at first is best adopted for success; decide which sessions you are doing and when and avoid missing these sessions at all costs. All the chat about zones, heart rate, power and perfect nutrition will come but for now, just aim to get out there and swim, ride and run. Throwing in three sports to an already busy life can cause headaches. Because of this, working with a coach can take the unnecessary stress out of your planning and provide unbiased feedback and support. For a budget option, you can buy a decent guide book such as Be Iron Fit or Half Iron Secrets by Don Fink, which is a go-to for many triathletes beginning their journey. Either a coach or a good book will be able to provide more structure to your training plan, and help you understand more about training blocks and cycles to get the most from your efforts. Coaching is also brilliant for those new to the sport because they provide (sometimes on-call) answers to the many questions you’re likely to have along the way. If budget won’t allow, then joining your local triathlon club will get you up close with loads of folk willing to tell you all about their experiences and answer all your questions! Heart rate and power are the two most common measures for your cycling, and most triathletes use heart rate for running and swimming. The folks down at Collareta can talk to you about your options for investing in a power meter for your bike, and they can help you choose a heart rate monitor and GPS for triathlon that will be most useful for you. If you don’t want to go technical though, that’s ok. Don’t underestimate the effectiveness of RPE (rate of perceived exertion). The more you train without the gadgets, the more you’ll begin to know your own zones, completely free of charge. What’s in the kit box? Rub-stick to avoid painful chaffing during the swim around the neck area, not a good combination with sunburn on the bike! A tri belt, which will enable you to spin your number around from bike to run without safety pin annoyance! While many of us want to get stuck straight into a meaty race like IRONMAN, there’s a lot to be said for building up to going long. 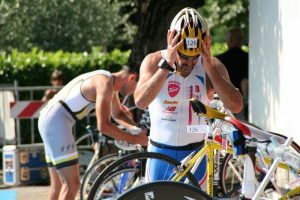 Most triathletes start with a sprint or super-sprint distance to get a feel for transitioning through the sports and that lovely feeling of ‘jelly legs’, along with the practicalities of transition itself. Olympic distance is the natural next race to try and from there you can build up to a half Iron and then full Iron distance if you fancy it! For race day preparation, it’s good to pack your kit into a plastic box, making it easy to carry it all into transition and also to keep it dry with a lid should you (gasp) have a rainy race day! On the big day the golden rule is to eat your breakfast and take on nutrition exactly as you have done in your preparation. Finally, try not to swallow too much lake or seawater if you’re doing an open water swim as this can wreak havoc with your stomach on the bike! With all these tips in mind, the key thing to remember is that the best way to learn is to just give it a try. Try not to take it too seriously, there is rarely such a thing as a perfect race or perfect preparation for the non-professionals! As World IRONMAN Champion Chrissie Wellington says, “Perfection is doing the best that you can in the context of your life.” And we couldn’t have said it better ourselves. If you’d like to chat about the best kit for your bike for a triathlon, come as see us at Collareta or give us a call! We provide expert advice and testing on TT bikes, which are excellent for racing in triathlon. PreviousWhy your local bike shop is your best friend for deals, advice and payment options.